Interesting back story: A practitioner I met once some time last year suggested that I get this book as she intuited some connection between this Yogi and myself…something to do with life lines…ahem, I’ve forgotten the exact information obviously..hehe. So, my sister kindly ordered the book for me via the Violet Flame where she works and it arrived promptly with no hassles what-so-ever, that is to say the hassles sort of began when the book reached my hands. Excitedly flipping through the book I was full of expectations to have this great DING moment multiplied a gazillion times because well….I was CONNECTED with this guy, right?!? As usual…nothing of that sort happened. I couldn’t get through the first 3 chapters without falling asleep and try as I could I found it boring and the language! Oh! The English language of the 1940’s …it was not very friendly to me. So, sadly and secretly quite gladly I just left it sitting on my bookshelf …occasionally my eyes would sweep past it and I’d wonder…. I have long exercised an honest introspection, the exquisitely painful approach to wisdom. Self- scrutiny, relentless observance of one’s thoughts, is a stark and shattering experience. It pulverizes the stoutest ego – part of the discourse between Paramahansa and a sadhu. The human mind, bared to a centuried slime is teeming with the repulsive life of countless world – delusions. Struggles of the battlefield pale into insignificance here, when man first contends with inner enemies! No mortal foes these, to be overcome by a harrowing array of might! Omnipresent, unresting, pursuing man even in sleep, subtly equipped with miasmic weapons, these soldiers of ignorant lusts seek to slay us all. Thoughtless is the man who buries his ideals, surrendering to the common fate. – part of the same discourse as above. Ostentatious display of unusual powers is decried by masters. The Persian mystic, Abu Said, once laughed at certain fakirs (Muslim ascetics) who were proud of their miraculous powers over water, air and space. “A frog is also at home in the water!” Abu Said pointed out with gentle scorn. “The crow and the vulture easily fly in the air; the Devil is simultaneously present in the East and the West! A true man is he who dwells in righteousness among his fellowmen, who may buy and sell, yet is never for a single instant forgetful of God. On another occasion the great Persian teacher gave his views on the religious life thus: “To lay aside what you have in your head (selfish desires and ambitions); to bestow freely what you have in your hand; and never to flinch from the blows of adversity!” – Paramahansa’s thoughts on the “wonder-workings” of the Perfume Saint as such which though awesome to experience really don’t serve much spiritual purpose. It’s basically to teach us that when we use the powers within us it should not be done for entertainment purpose but instead to help enhance the evolvement of ourselves and those of others. This quote reminds me of Albert Einstein’s quote : “The intuitive mind is a sacred gift and the rational mind is a faithful servant. We have created a society that honors the servant and has forgotten the gift.” To me it seems to fit very well with the teachings the like of Edgar Cayce’s readings; the mind is important but the intuition, the seat of wisdom within us is as or more important than the mind, while our bodies, the vehicles of our spirit, that which is governed by the 5 senses is just a manifestation of spirit and mind. Looking forward to finding out your connnection to him. I just wrote about Muktananda on Leigh’s blog. So bizarre. I have a couple. I used to go to the Siddha Yoga Center (that’s Muktananda’s) like an LA ashram and chant, as I was telling Leigh. I might visit when I am there. Hmm…Swami Muktananda sounds familiar! The knock on the door was basically a suggestion from the person leading us in a class that I am taking that we read the book as it talks about Alchemy. So…I decided, here’s the direct invitation to read the book..so lets do this!! I would like to read his autobiography again now. I am looking forward to all your posts on him. Yeah, and I also was not too fond of disparaging the body. The body IS a divine vessel, that is at least my philosophy. I have a feeling that different people feel differently about this Monika. What I mean is that to some extent I understand where they are coming from. My sister to some extent feels the body as restrictive at times…she sounds like a Yogi when she gets into those moods! LOL! I feel it too…just slightly, and not all the time. Rarely in fact. Like the body weighs me down…I want to fly! Then again it could just have been me stuffing my face and feeling sluggish..lol. Sometimes he has a Christian flare which is a bit weird for me but I used to go to The Self Realization Center in Malibu a lot. Its around a man made lake and very peaceful and beautiful. I have this pocket sized cards with his sayings that I recently took to work and read. I sometimes think Shree, that those knocks on the door come only when our minds are ready to receive the gifts .. I know in the past in the 80’s I read a book from my spiritual friend, who just raved about its contents, I dismissed it as being quite fanciful and nonsense at the time of reading.. Only to read many years later to totally comprehend its message and understand its deeper meaning… So I agree with you, you are now ready to hear its message..
We are living in a delusional world… as our illusions of reality are based on that which we learn via our viewing through the lenses of others namely the Media.. Thank you Sue for your comment! It’s true…a lot of times certain things just don’t resonate with you until it is time..and then there are times when the same thing gives a completely different meaning! That quote which you liked is a loaded one isn’t it? The true battle is that within us as we try to discern the truth of ourselves and all the things which have piled on us…it’s sometimes so easy to just not care and carry on in a sleepless state…but to what end? Glad you’re enjoying his thoughts. 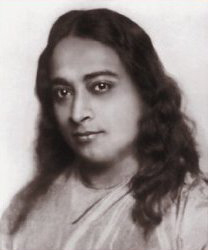 I’ve never heard of Paramahansa Yogananda before. He certainly has some interesting thoughts and views about what we are. I’ve had the opposite thing happen. I remember thinking “Ada” by V. Nabokov was my favorite book when I was around twenty. The other day I hauled it off the shelf and I couldn’t understand any of it. I don’t think it was him. I think I’m getting stupider. LOL..I don’t think it’s you becoming stupider! It’s just that you have transcended the message or content of the book…the other thing could be that you are “taking a break” and then the next time you take the book out, it will show you another whole new dimension!! !